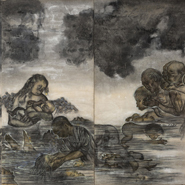 Hiroshima-native Iri Maruki (1901-1995) and his Hokkaido-born wife Toshi (née Toshiko Akamatsu, 1912-2000) collaborated on art works that depicted human catastrophes such as war and pollution. 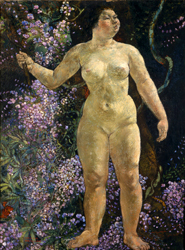 Iri, who developed a unique style with ink painting, and Toshi, who studied oil painting at Joshibi University of Art and Design, began their married life in Tokyo in 1941. After visiting Hiroshima in the wake of the atomic bombing in August 1945, they created an early trilogy as part of a series called The Hiroshima Panels. These works, 1. Ghost, 2. Fire, and 3. Water, based on the artists’ own experiences and stories recounted by family members, were first shown in 1950. When the works travelled around Japan in the early 1950s, a time when press restraints were still in effect, the pictures, some of the earliest visual documents of the horrors of the bombing, came to be a symbol of anti-nuclear and anti-war sentiment. Along with the series’ tremendous social significance, the works are unusual in that they combine Toshi’s delicate Western-style depictions of human figures with Iri’s bold Japanese-style ink-painting techniques. In addition to these first three pieces, this exhibition includes the next two works in the series, 4. Rainbow and 5. Boys and Girls, and a second version of the trilogy that were made to meet with rising demand as The Hiroshima Panels toured the country. 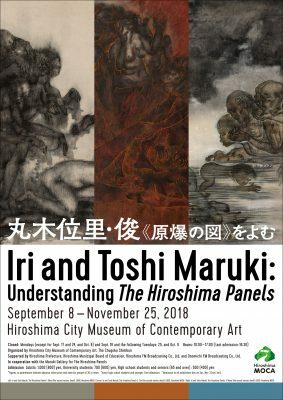 Along with works that each artist made independently before and after the series, the exhibition locates the experimental approaches used in The Hiroshima Panels in the broader scope of Iri and Toshi Maruki’s practices.